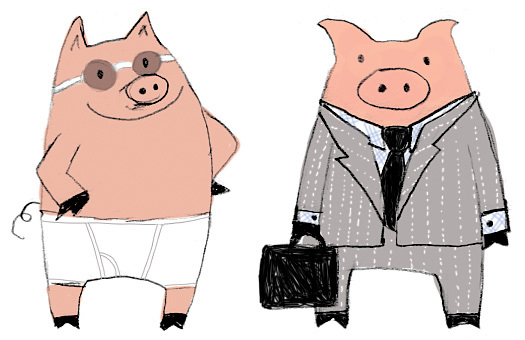 Final Swim Pig and Business Pig. The style is a departure for me. I upped the contrast of my original pencil sketches in Photoshop and then colored them digitally. Happy New Year everyone! We’ve got lots of great interviews, process posts, books, and more to share with you in the coming months. 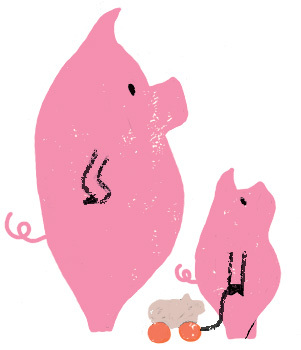 A variation of Business Pig in paper with pencil details overlaid in Photoshop. Mama pig and piglet. Only the piglet made the cut in the final logo.